You’re stronger, wiser and more powerful than you think. And I know that because you have a tendency to doubt yourself or talk yourself and your achievements down. It’s called being human, welcome to the club! However, the one thing we need to be completely clear on and confident in is the truth about who we actually are. A great place to start is with our ability to reframe, pivot and go again because failure isn’t an if it’s a when. Luckily, resilience is a choice, that becomes a habit, and with practice, part of your character. Your FREE Risilience Ninja Toolkit will enable you to embed ambitious resilience in yourself and those you influence. The hilarious Northern comedian, Peter Kay, does a standup routine about dipping biscuits in your tea. He explores the perils of trying to get your Rich Tea biscuit out before it dissolves after only one dunk and contrasts that with the resilience of the Magnificent Chocolate Hobnob! Google ‘Peter Kay Hobnob’ to see him in action. He uses a few choice words that you’re not going to want young ears hearing so I’ve recored this version for you. It’s based on my lesson plan for embedding ambitious resilience in my Year One class so is a definite U rating. I had the badges above made and gave them out to students to wear when they were resilient. I saw my kids grow an inch when I pinned one of those badges on their top. 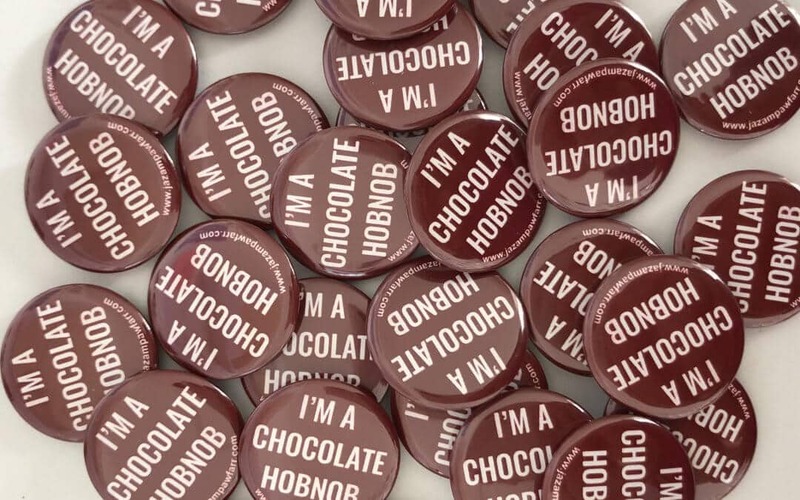 The badges became great talking points as other children and staff stopped my kids in corridors to ask them to explain exactly why they were a Chocolate Hobnob! 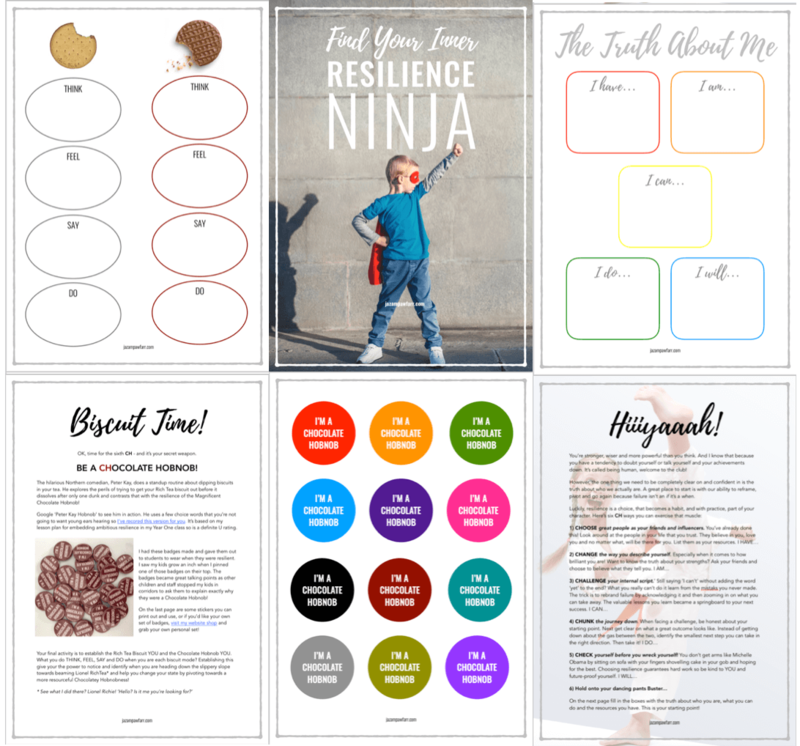 In your FREE Resilience Ninja Toolkit you’ll find a whole page of stickers you are print off and use. Or if you’d like your own set of badges, visit my website shop and grab your own personal set! I’ve finished your toolkit off with a final activity to establish the Rich Tea Biscuit YOU and the Chocolate Hobnob YOU. What you do THINK, FEEL, SAY and DO when you are each biscuit mode? Establishing this give your the power to notice and identify when you are heading down the slippery slope towards beaming Lionel RichTea* and help you change your state by pivoting towards a more resourceful Chocolatey Hobnobness! * See what I did there? ’Hello? Is it me you’re looking for?’ Lionel Richie? Rich-Tea!